Mastering the Fastpass System at Disneyland is like finding a golden ticket to the chocolate factory, just lying in the street. Maybe that’s a slight exaggeration, but this system is essential to the success of your Disneyland experience, so please read on! The Fastpass is a predominantly FREE service that allows you to skip the queues at your favourite attractions, so you can maximise your time at either of the parks. It is also used to reserve your place at popular shows like Fantasmic! and World of Colour. Describing how this system works can get quite complicated but I will try my best to keep it simple with plenty of pictures to help along the way. For the purpose of this exercise let’s use Space Mountain as the example. Step 1: Choose a ride you would like to get a Fastpass for and head in that direction. 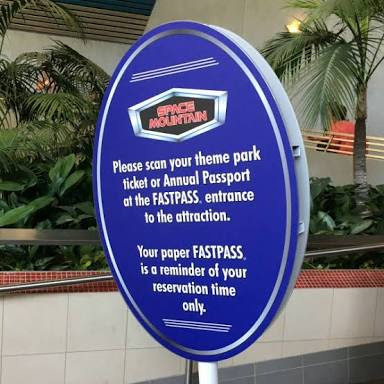 Step 2: Nearby the ride entrance there will be a sign displaying the words “Fastpass Distribution” As well as a return time. Step 3: Scan your park admission ticket at one of the machines (shown below). After recent changes this ticket is not valid to access the Fastpass queue and only serves as a reminder for the time you can return. These times will vary widely. Step 4: Line up for another ride, go have lunch or see a show! Basically do whatever you like while your Fastpass queues for you. Step 5: Grab another fastpass as you are often able to get another one a little before your Fastpass Window. Step 6: Return to the ride with your park admission ticket at the ready. Go into the Fastpass queue (not standby), scan your ticket and enjoy! You must be there in the hour window you are given or the Fastpass expires! Top Tip: You can only get one Fastpass at a time so choose wisely. If the standby queue is 30 minutes and under don’t bother with a Fastpass, as this is a waste. Save it for the 45 minute plus attractions. The bottom of your reminder ticket will let you know what time you can get a new Fastpass for another attraction. 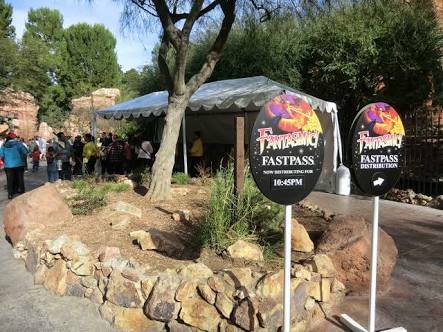 You will generally need to wait 30 minutes-2 hours till you can get a new Fastpass, depending on crowds and ride popularity. The image below shows what happens if you try to pull sneaky one. Not all rides are fitted with the Fastpass service so here is a list of all that are. 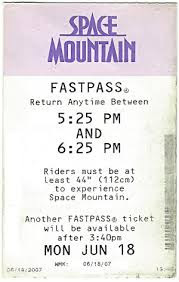 Top Tip: For the really popular attractions fastpasses can and do run out very quickly. 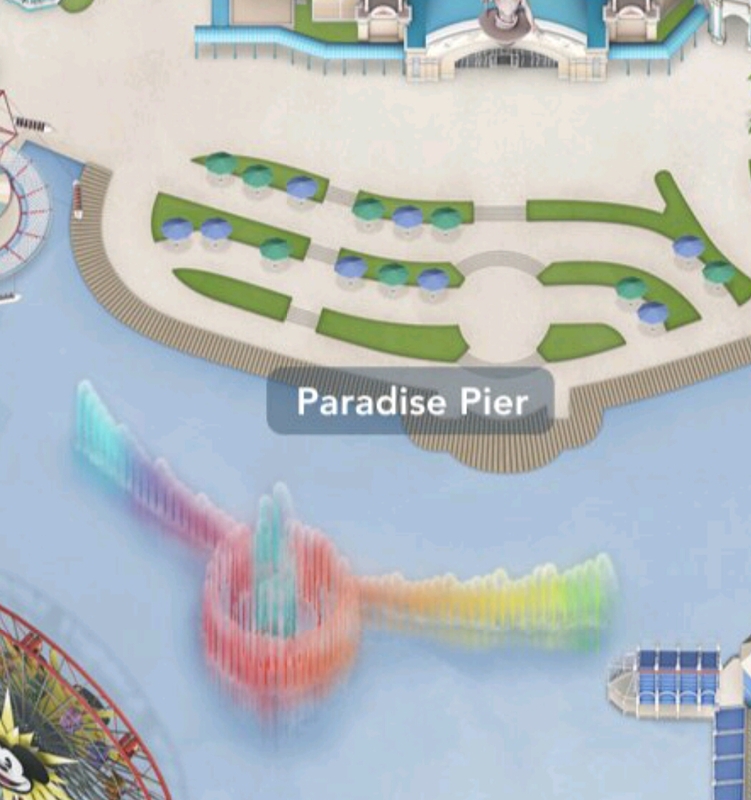 So if you want to get on one of your favourite rides quickly, getting a Fastpass should be your first move in the park. The rides with an asterisk, in the list above, are the ones likely to run out of Fastpasses quickest. 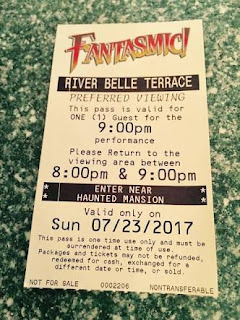 To see one of the nighttime spectacular shows you will also need a to get a Fastpass. 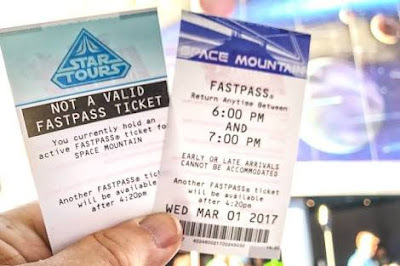 These Fastpasses are disconnected from the rides, which means you can hold a pass for a show and still obtain others. The two shows you need to reserve a place for are: Fantasmic at Disneyland and World of Colour at California Adventure. For both of these shows you will need to pick up your Fastpass pretty early in the day, as they run on a purely first come first serve basis. Distribution for a Fantasmic Fastpass is Opposite the Golden Horseshoe Saloon, along the Rivers of America, in Frontierland. The show itself will take place on the Rivers of America, in front of the Pirates of the Caribbean Ride, New Orlean’s Square. 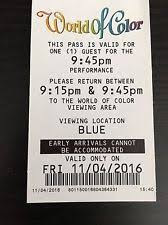 You need to retain this paper Fastpass as this is your actual ticket for the show. It tells you the time of the show and the section you will be watching from. World of Colour Fastpass distribution can be found to the right of The Little Mermaid Ride on the northern end of Paradise Pier. The show takes place on the Lake at California Adventure looking toward Mickey’s Funwheel and the rest of what will be Pixar Pier. Top Tip: Much like the popular rides, Fastpasses for the shows also get snapped up quickly! If you have planned to see one of these night time shows head to either of the Fastpass distribution points upon entering the parks to reserve a good spot. What this means is that instead of walking to the rides and physically getting a Fastpass you can stand in either park and reserve a pass wherever you are. The catch? Well the only real catch is that it costs $10 per person, per day. So that’s $50 a day extra on your ticket, for a five day park hopper. 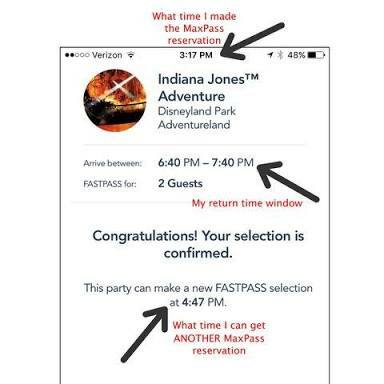 Alternatively, you can just purchase your tickets as normal, then when you enter the park buy a daily Maxpass for $10 through the App. If you have ever used the Rider Express App at Dreamworld, then you know the basic concept. You have a list of the rides fitted with Fastpass facilities along with Standby Wait Times and Return Times. You simply choose a ride and wait till your return time. This system is only slightly more complex due to a couple of extra features. Step 1: Download the app and sign up for an account. This step links any tickets you have purchased to your app. Step 2: When you enter either of the parks purchase a Maxpass. It cannot be bought until you are physically standing in one of the two parks. Step 3: It will then ask you to add in the members of your party who have also added a Maxpass to their tickets. If you have purchased tickets on the one account this step should be a breeze. 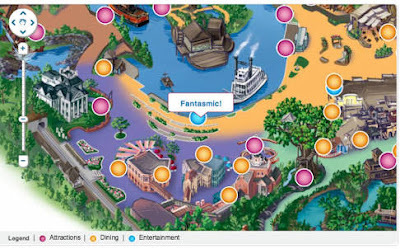 Step 4: Choose the park you would like to make a Fastpass selection for. Step 5: The list of rides should come up and display necessary information. Choose the ride you want and how many of your party would like to ride. Step 6: Same as the normal Fastpass. Queue for other rides, shop and do whatever as you wait. Step 7: Get a new Fastpass. 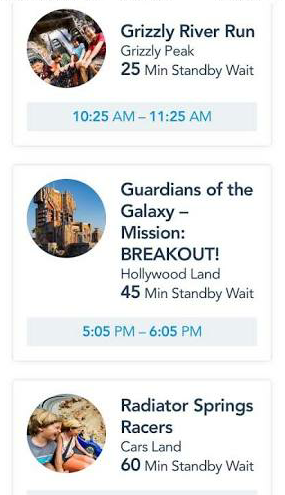 The wait between getting a new Fastpass is around 30 minutes to 1.5 hours maximum rather than two so you have a half hour jump on those that don’t have Maxpass. What your screen looks like after making a selection. Step 8: Head to your ride with your phone at hand and have it scanned at the Fastpass entry and enjoy. Important: You cannot reserve your place at Fantasmic! 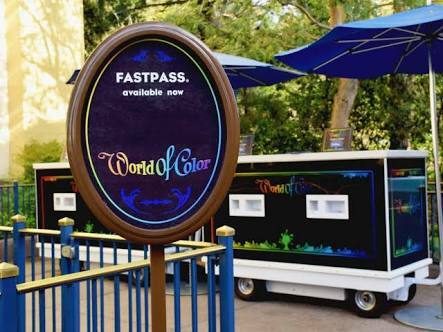 or World of Colour with Maxpass so make sure you get your paper ticket at the booths highlighted previously. Top Tip: Even though you have to be standing in one of the parks to buy the Maxpass, once it is paid for you can make reservations from anywhere, including your hotel. So if you have a family and need a hotel break, get a Fastpass or before you leave. Maxpass is definitely handy but is it actually worth the $10 per person per day? My initial reaction is yes, yes it is. But only because I am familiar with the ins and outs of Disneyland and California Adventure. Getting physical Fastpasses definitely helped me get to know the parks well and, on the occasion, see a street show or band that I may not have seen otherwise. Indeed, half of the fun of Disneyland is exploring the park itself. On the other hand, the convenience of it all is hard to ignore, especially if you have your children with you. To be able to have lunch and not rush off to grab your Fastpass, with kids in tow, definitely appeals. Furthermore, the fact that you can also reserve a Fastpass from one park to the other and also from your hotel room during the day is perfect for parkhopping. So what to do? I don’t want to pay through the nose and miss out on anything but I also like the convenience. – If you are at Disneyland for 1 or 2 day park ticket, get Maxpass. It is the most efficient way to do Disneyland so you should get on everything you want to in that time. Plus it’s only $10-20 extra. – For a 3 day pass, spend the first two getting around and exploring using the paper system. On your last day utilise the Maxpass to its full extent and park hop. – With a 4 or 5 day park ticket the world’s your oyster and it’s completely up to you. However, like the 3 day pass strategy, spend some time at both parks exploring. Then get a Maxpass for 1, 2 or 3 of the days if you feel its necessary. This will ensure you keep costs down but get super efficient at the end when you are most exhausted. 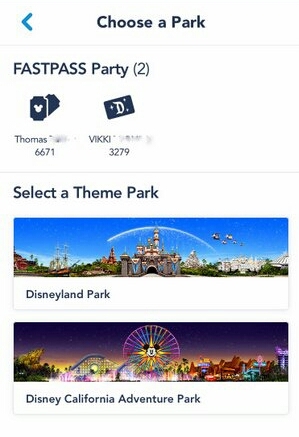 – If you are there during peak times, when it’s super crowded you might just have to bite the bullet and get Maxpass, as this will allow you to beat the crowds in some way. – The last option of course is to just use the free Fastpass your whole stay. Still has the same basic effect so you won’t be missing out on too much, especially if you have a multi-day pass. Final Tip: With the new Fastpass systems in place you need to take out your admission tickets a lot. So you don’t lose them, pop them in a see through lanyard or the clear part of your wallet for easy scanning. You should also take a photo of all your park tickets including the bar-code so that if you do happen to lose them, they can be replaced! These options, as always, are exactly that; options. 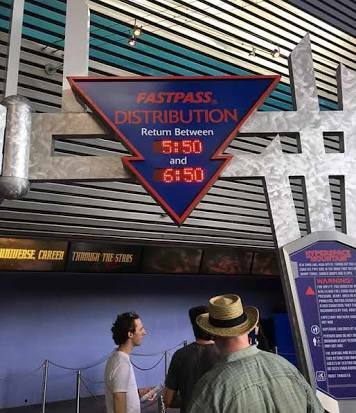 I hope this information on the Fastpass system is useful. Any questions please ask in the comments section. Next up we have the Parent Rider Switch system and its awesome benefits! Stay tuned!